Live it! UGA Housing: C.L.A.S.S. Advocates and Resident Assistants … A League of Our Own! C.L.A.S.S. 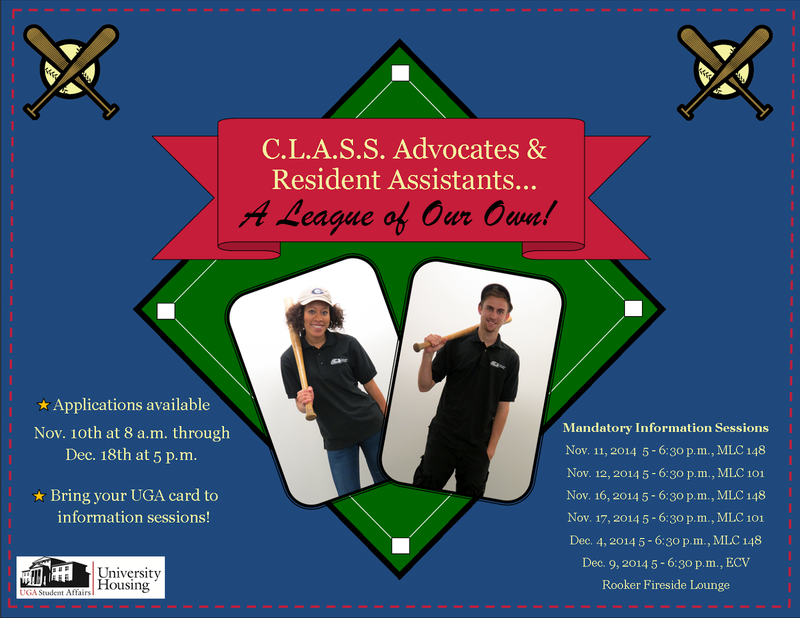 Advocates and Resident Assistants … A League of Our Own! Have you ever thought about joining the team of over 200 C.L.A.S.S. advocates and resident assistants who live and work across campus? Here is a guide to coach you through the application process! Those applying to be a CA-RA must attend an information session to be eligible to apply. Please bring your UGACard with you to the information session so that we may record your attendance. Applications will be available online November 10, 2014 at 8 a.m.! All application materials are due: December 18, 2013 at 5 P.M. Curious about what a C.L.A.S.S. advocate and resident assistant really do? Watch this video about current CA-RA staff members and their daily life in the residence halls. For more information about the CA-RA application process, please visit our website or contact University Housing’s Staff Development and Student Conduct Office at (706)-542-8191. Apply to be a C.L.A.S.S. advocate or resident assistant and become part of a winning team! Rachel Vandergriff is a first year Master’s student in the Social Work Program at the University of Georgia. Currently, Rachel serves as the Graduate Resident for Undergraduate Staff Development in University Housing.